The La Harpe City Council voted 4-3 Monday night to terminate Water Department employee Daniel Carpenter, retroactive to Friday, December 4. Carpenter's firing was just one of several contentious issues discussed at the council meeting. 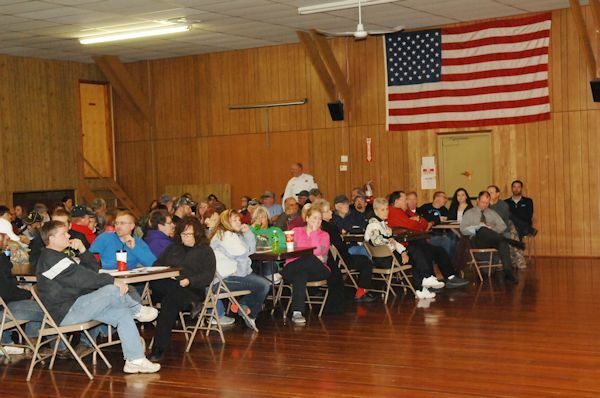 The meeting was moved to the La Harpe Community Club House to accommodate the 124+ residents who signed in. The meeting which began at 7:00 p.m., lasted three-and-a-half hours as the public comments section of the meeting took about two-and-a-half hours. The council voted on a tie vote broken by Mayor Kienast to enter executive session about 10 minutes into the meeting. The council approved terminating Carpenter on a 4-3 vote after they re-entered the regular meeting. Voting "yes" on termination were Kenny Foster, Marcia Stiller, and David Mershon. Voting "no" were Amy Palmer, Josiah Neff, and Darrell Kraft. Mayor Ryan Kienast voted "yes" to break the 3-3 tie. For the first time ever, Treasurer Marcia Neff was asked not to go into executive session and to leave the club house with everyone else for the executive session. City Attorney Kurt Dittmer was invited into the meeting. When former council member Brian Lovel questioned why Neff was asked to leave, Attorney Dittmer said that Neff and City Clerk Lucretia McPeak are not considered city council members. They are only present in an executive session meeting if invited by the council. going to a business and telling a co-worker of a resident that her water was going to be shut off for being delinquent on the bill. Carpenter said he had a letter from the resident he was accused of telling about her water bill. "I never went to a place of business and told them that they owed on their water bill," said Carpenter. This issue was possibly a mix-up with another one where council member Kenny Foster told a person that her water was on the disconnect list. Some people said this was the case, while others said the two were separate incidents. Carpenter said he was never given any deadline for attaining the Class A license other than "as soon as possible." Kienast said there was a deadline. Several people who supported Carpenter said the reports of him being at home during the day were because he worked later than others did. They pointed out that he told his supervisor, Tim Graves, if he needed to go home for some reason. Kienast said Carpenter had a work schedule, and the council was not told when he needed to deviate from it. "The police and street departments seem to be able to tell us when things like this happen," said Kienast. A related issue was the city holding a meet-and-greet with a prospective water department employee. Some people were upset that the position was not advertised, the person at the meet-and-greet was not from La Harpe, and the meeting was held either shortly before or shortly after Carpenter was fired. "In the 30-plus years I have been here, we have never had to go outside the city limits to hire someone," said Tim Graves. "You never posted the job. That is wrong. You need to start doing things right." Kienast said the city was contacted by people asking about a job once word got out about Carpenter's firing. The meeting was with two council members at city hall. Others were upset that Stiller contacted the Blandinsville water superintendent about covering for La Harpe as a backup plan if necessary. They interpreted it as the city looking to hire someone from outside the city. Another contentious issue was the handling of the water bills, which was carried over from the last council meeting. Carpenter handed out a packet of papers before the meeting, which contained signed statements from Water Superintendent Tim Graves, water billing agent Monalisa Graves, and council member Josiah Neff that covered what each remembered about interactions with Kienast over the handling of a change in the city's water billing ordinance and how it impacted a building that Kienast had purchased. The packet also contained an email from Marcia Stiller to Monalisa, a letter from Kienast to Monalisa, and the second page of the water-billing ordinance. Some have accused Kienast of manipulating the council to have the water-billing ordinance changed, so he saved money on his water bill for a building he recently purchased. Public Works Chair Marcia Stiller said she began working on the water-billing ordinance one-and-a-half to two years ago after receiving word that beauty salons were being charged an additional fee, because they had a business at home. "Day cares, cake decorators, and quilt makers were not charged for this. My goal was to see that everyone was treated fairly," said Stiller. Stiller said the city was turned into the states attorney who in turn, asked the city to clarify the ordinance. She asked Dittmer to look at it and make a recommendation. The recommendation was to remove section A from the ordinance and leave everything else in place. Stiller said the council decided to be more firm about delinquent bills this year and voted to turn off water service if a bill was delinquent after a short grace period. The delinquent water bill amount has been between $6,000 to over $20,000. The final issue was Josiah Neff's complaints who said the council is not doing things in a correct way. He pointed out that he is the only council member on one committee which is ESDA, a sub committee! He had two committee assignments under former Mayor Ken Brown. "Why am I only on one committee? Why do I not have equal representation for my ward?" Neff cited items being voted on that were not discussed at council meetings. He talked about the vote for building a wall in the former garage area of city hall, which he said was not talked about before the meeting when it was voted on. He also said that votes were taken to spend money for things that were not on the agenda. Neff also cited the announcement at a council meeting that Love La Harpe was bringing a Peace Corp Fellow to La Harpe. "Did anyone from Love La Harpe ever ask us to use city hall or offer to give us $30 or $35 a month for Internet? "Nobody came up and asked us if they could use that space," said Neff, who voted "no" on the issue. Mayor Kienast then spoke about the rules of speaking at a council meeting, which were drawn up during the past week. Lacie Thompson approached the council and asked questions pertaining to rules and voting. She also questioned why her Ward was not represented, on committees, by her Alderman. Monalisa Graves spoke to the council and explained the reason why her daughter's water wasn't shut off, was because she paid the bill for her. Delbert Kreps asked Mayor Kienast how much he was saving on his water bills, and the Mayor replied, "nothing". Kreps later returned to the council and asked why there was so much police protection there (state police, sheriff, deputies and local police). Brian Covert addressed the council over an incident at city hall on Tuesday, December 8 at 5:30 p.m.. Apparently, there was a "meet and greet" with 2 Aldermen and a prospective applicant for the water position Carpenter had held. Willo Carpenter asked the council why her husband, Daniel Carpenter, was fired. She asked if he was told he would be fired if he didn't pass his last test. Rebecca Quivey spoke to the council concerning an incident which she thought had happened at her business, but it turned out, it hadn't. Jan Stokke spoke to the council about her water bill, and thanked Stiller for telling her their water would be shut off and still had 1 day to pay. Tim Graves reminded the council that Stiller was put in charge of the delinquent water bills over 2 years ago. Stacey Pence approached the council and conveyed that they should be getting along, and work together. Kale Burgdorf informed the council of activity in the cemetery at all hours of the night, and asked if this could be investigated. Monalisa Graves, again, addressed the council concerning an incident at the grocery store. Apparently Foster had informed the wrong person of their late water bill. Dave Clover asked if someone on the council called Blandinsville to see if they could use their water department employee's class A license and help out La Harpe. Stiller replied that she had inquired. Clover stated to Mayor Kienast that he should hire Carpenter back and apologize to Tim Graves, and in his opinion, if the job as Mayor was too difficult, then he should step down. Stiller explained about the delinquent water bills, and how they have been addressed. Kreps returned to the podium to address the council and stated he had a signed petition for the Mayor to resign, and handed it to Alderman Neff. Retired Mayor Kenny Brown, who had served longer than any other La Harpe Mayor (35 years) gave some positive comment on some of the things Mayor Kienast was involved in. He also mentioned that he was looking up and giving some answers. Brown invited Mayor Kienast to come into his home and ask questions of him any time and he would be glad to help him out. Several other residents spoke and many who had already spoken, voiced pretty much the same questions and concerns. Mayor Kienast asked for an adjournment, and Neff stated he had a petition with 100 names, and asked Mayor Kienast to resign, to which Kienast responded with a "no". In other news, Stiller reported that January 5, 2016 is the next date for disconnecting residents who are delinquent on their water bills. A representative for the city's insurance plan will attend the council meeting on Monday, January 11. The council approved the low bid of $13,900 by Lawn Care Solutions (Jamie Hallowell) of Avon to mow the city cemetery. There were three bids for mowing. The next supervisor's meeting will be January 7th, at 4 p.m. at city hall. The December 28th city council meeting was canceled due to its proximity to Christmas. The next council meeting is Monday, January 11th at 7:00 p.m..
City Clerk Lucretia McPeak, and Mayor Ryan Kienast. John Louden, and Barb Louden. (136 signed in. Nine were council members, several others were missed or did not sign in). 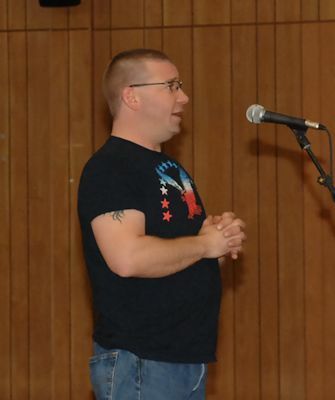 Former Water Department employee Daniel Carpenter speaks during the public comments period of the LaHarpe City Council. Josiah Neff, Amy Palmer, Darrell Kraft, Mayor Ryan Kienast, Marcia Stiller, Kenny Foster, and David Mershon. 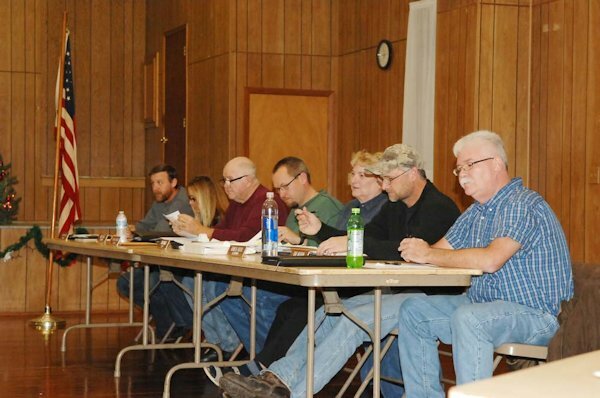 Over 125 citizens attended a lengthy La Harpe City Council meeting Monday night which was moved to the La Harpe Community Club House to hold a larger crowd.